At prolight+sound show 2009, Frankfurt, Germany, Roland Systems Group (RSG) introduced the RSS M-48 Live Personal Mixer and RSS S-4000D Splitter and Power Distributor, an innovative monitoring solution for live performance and studio applications, and a logical progression for the current suite of RSS stage sound control and mixing products. 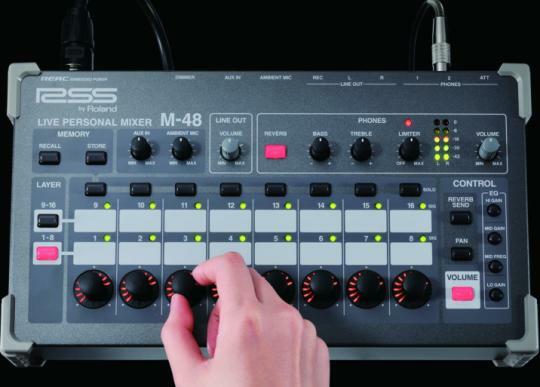 For the performing musician wanting the best possible sound quality and flexibility in their individual stage mix, the M-48 offers control over 40 audio sources that can be easily managed in 16 assignable stereo groups. The playing experience is enhanced with level/pan/solo/3-band EQ on each group, high quality built-in reverb for a more appealing sound, ambient mic for better communication with band members as well as physical inputs and outputs for multiple headphones, wedges and powered monitors, interfacing with iPods, metronomes and external recording devices. Crystal clear sound quality is ensured by use of Roland's Ethernet Audio Communication (REAC) Cat5e protocol. Power is supplied via the RSS S-4000D Splitter and Power Distributor, which can provide the digital audio stream and power to up to eight M-48s. Multiple S-4000D can be used in a configuration. Configurations are straightforward with the ability to control, save and recall all connected M-48s from either an M-400 V-Mixer or PC (when using RSS Digital Snakes with other consoles). This allows the FOH engineer or other technical operator to assist in setup and mixing if desired. Existing M-400 users require the Version 2.0 update which also contains significant additions including support for LCR sound systems, vintage effects, expanded PEQ and GEQ capabilities, real-time analyzer and other user interface enhancements. The M-48 Live Personal Mixer can be integrated with other digital or analogue consoles using a choice of RSS Digital Snakes and included PC software for setup and control.